Bucket lists are all the rage, and it’s no surprise. Despite our overstimulated and consumerist culture where there’s always something to do and something to buy, we’re slowly realising that you can’t take your possessions with you and quality time is priceless. Whether you’re the type of person who loves nothing more than saving up to buy the latest technology or a brand new wardrobe each season, it’s worth thinking twice about how you spend your hard-earned cash. Here are four reasons why investing in experiences pays off much more than buying objects ever could. We’ve known for some time that looking after your money and avoiding financial stress is good for your well being. And now new research shows that the way we choose to spend our money has a big impact on our happiness. 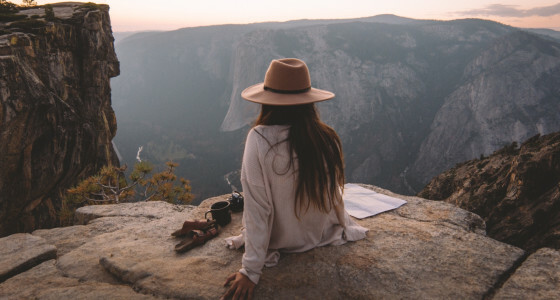 While a week’s holiday may seem like a short-term pleasure compared to a top of the range TV or new clothes that could last for years, studies show that it’s actually the experience that makes us happier in the long run. As part of a major study, psychology professor Dr. Thomas Gilovich asked people to self-report their happiness with major purchases, and found that although material and experiential purchases were ranked about the same initially, over time people’s satisfaction with the things they bought went down, while their satisfaction with the experiences increased over time. The ‘more experiences, fewer objects’ approach has been advocated by James Wallman, whose popular book Stuffocation: Living More With Less argues that we could be much happier if we swapped our objects for experiences. According to Dr. Gilovich, our satisfaction with material objects dwindles because we rapidly get used to having them, while experiences are intertwined with our identity. Crucially, shared experiences connect us with other people in a way that objects don’t: a holiday with a group of friends forges bonds and creates memories that can last a lifetime. There’s a good chance we’re preaching to the converted here as studies also show that a large majority of millennials already prefer to spend their money on ‘doing stuff’ rather than ‘buying stuff’. A study of American millennials found that 78% would rather spend money on a “desirable experience or event” than on buying something desirable. The reason for this is clear, and chimes with Dr. Gilovich’s findings: 69% believe that attending live events and experiences makes them “more connected to other people, the community, and the world”. There’s a lot to be said of giving the gift of an experience, rather than an object, to someone you love. It’s something you can tailor to their interests and experience together and, whether it ends up being good or bad, you’ll have a shared memory. There’s a social media dimension to all this too. Snaps of the amazing place we’re visiting or the brilliant band we’re watching have a lot more social currency than showing off the new product we’ve bought. Sure enough, the study of American millennials showed that craving recognition and a ‘fear of missing out’ were driving millennials’ experience-seeking. This links back to Dr. Gilovich’s point about identity: having these experiences and sharing them on social media gives us the sense that we’re building and reaffirming our identity. So next time you’re thinking of buying the latest phone or a new jacket, consider investing your spare cash on art exhibitions, sports events, gigs, learning a new skill or travelling. Do you spend your cash on objects or experiences? Tell us in the comments. Sign up to PensionBee to take control of your pension saving.